Peasenhall is, for my money, one of the loveliest and most interesting villages in Suffolk. It is a curious place too, for it is that rare thing in rural Suffolk, a 19th century industrialised settlement. It was here that James Smyth invented the seed drill, and set up the Suffolk Seed Drill Company. Their factory sits right up against St Michael's north wall. A drain or brook runs the entire length of the high street with its super village shop. The brook is politely known as the River Yox, but this is in fact just a backnaming derived from neighbouring Yoxford, rather than the other way round. At first sight, St Michael looks pretty much all of its rebuild of 1860, but there is more to it than meets the eye. You reach it by crossing the brook and wandering up a lane by the imposing war memorial. You approach the church from the north. 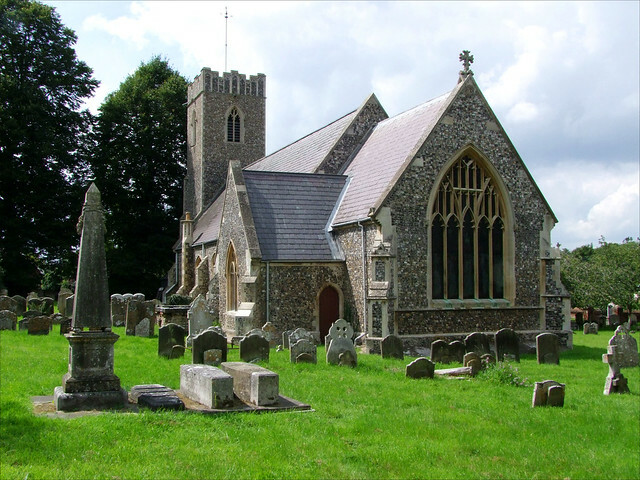 The residents of Sibton Hall paid for the rebuilding, which consisted of the nave and chancel in their entirety. The 15th century tower was extended, and the only real survival was the contemporary north porch. And what an excellent porch it is. At the end of an avenue of cherry trees, as at nearby Cransford, there are Suffolk's best preserved woodwose and dragon in the spandrels, squaring up to each other. On a sunny day, the interior can be a little gloomy, but as your eyes adjust to the light you can see that when it was rebuilt it was furnished and decorated in a seemly fashion in the evangelical tradition, with a biblical text above the chancel arch. The lovely late Norman font, which was retained from the earlier building, is unusual in Suffolk. Thomas Willement's glass in the east window is an interesting example of the 1860s style, the crucifixion simple, but augmented by good outer lights. A lavish 1890s brass to Joseph and Mary Lay records their donation of a tenor bell and bell frame to the tower. Wandering around outside, you might almost imagine yourself in the industrial midlands or north; the factory stands close to the south wall, and workers' cottages line the churchyard. Perhaps the most striking feature in the churchyard, though, is the enormous memorial in the south-east corner. It is to Mary Ann Smyth, who died at the age of 52 in 1877. On a wide base, a tall pinnacle arises from a broad pedestal. The pinnacle bears Mary Ann Smyth's portrait in relief, and is surmounted by a wreath of roses. What makes the memorial extraordinary, however, is that beside the pedestal are two life-size (death-size?) stone coffins, one with its lid off and lying beside it. I do not think I have ever seen anything quite like it. A few decades after Mary Ann's death, in the early years of the 20th Century, Peasenhall was the scene of one of Suffolk's great crime mysteries. A maid was murdered in the big house beside the church. A local man was arrested, but the jury could not reach a verdict. Copies of the book The Peasenhall Murder can usually be found in substantial quantities in Suffolk secondhand bookshops.